With the recent end of Jon Stewart's The Daily Show, now-Senator Elizabeth Warren took the time to share on Facebook her first appearance on the show six years ago. At the time of the 2009 interview, she was chairing a congressional oversight panel on the Troubled Asset Relief Program (TARP). TARP was created in the wake of the recent economic downturn to strengthen the financial sector by government purchase of assets and equity. The first time Jon Stewart invited me onto The Daily Show six years ago, I threw up backstage. I had gut-wrenching, stomach-turning stage fright. I was a no-name college professor there in 2009 to talk about oversight of the Wall Street bailout. It was important – and I didn’t want to mess up and become the joke. The first couple of minutes seemed so terrible, I thought I would have to resign from my new position on the TARP Congressional Oversight Panel. But when we got to the commercial break, Jon could tell that I hadn’t said what I’d come to say. He took my arm, told me to stay in my seat -- and then he let me deliver this message. That moment changed my life. I’m grateful for every single time someone has come up to me and asked: “Hey, aren’t you that lady I saw on Jon Stewart?” Because almost every time I’ve told someone, “Yup, that’s me,” they’ve followed it up with: “Keep fighting!” That’s what Jon has done for 16 years: with passion and humor, he skewered the people who needed skewering, called out the big guys who rig the system, and prodded us all to fight back. Thanks, Jon! What can you learn from this famous speech, which got close to 3 million views when she posted it recently on Facebook? Push through the fear and find your voice: Can you tell that she threw up backstage before this segment? I think not. But you can tell she has a distinctive point of view, and that carries her here, letting her find her voice on camera. Show your enthusiasm: She may have been a "no-name college professor," but Warren warms to her subject, and that warmth and enthusiasm are infectious. The speed of her delivery and her gestures underscore her passion as well as her points. Don't be afraid to put your passion and enthusiasm into your topic. Use familiar pegs to help us follow your new information: Warren's trying in this segment to share a different way of looking at how economic problems develop, so she ties it to a familiar-to-the-audience timeline of historic economic scandals and failures--with the twist of perspective we wouldn't necessarily know or have noticed. She also puts metaphors to great use, comparing the economy to a bus that needs to be pulled out of a ditch, and talking about pulling the threads out of the regulatory fabric, to give us vivid explanations of dry financial matters. And she continually brings it back to what's in it for the viewer: Your retirement fund or your savings. Take a look for yourself at the video, also linked below. 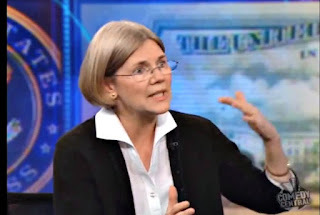 Warren, of course, went on to face severe congressional objections to an appointment for her in the Obama administration, stepped away from that role, and ran successfully for the U.S. Senate, where she continues to tear it up today as a great public speaker. I'm so grateful she shared this early life-changing example of her speaking as well as the backstory.